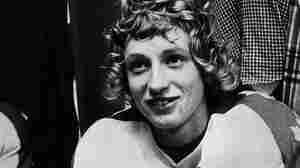 Wayne Gretzky NPR coverage of Wayne Gretzky: News, author interviews, critics' picks and more. October 26, 2016  The ice hockey legend marks the 99th anniversary of the NHL with his new book 99: Stories of the Game. Never mind the sport's tough guy reputation; "the game of hockey is an art," Gretzky says.